1) QUESTION: Did the Maya have wars? ANSWER: Yes. Though we know little about how an actual battle would have been fought, but we do know that the Maya waged war. There is little evidence of spear-throwers or bow and arrow and the Maya had no metal for guns or knives. They fought their battles hand to hand with lances and axes. The winners often took captives back home either to be sacrificed, made into servants, kept as prisoners in the palace court for political reasons or to serve as replacements for people lost due to war and disease. 2) QUESTION: Did the Maya sacrifice humans? ANSWER: Yes, but this was not a frequent ritual. Many of those sacrificed were captives taken in battle. Sacrifice was generally reserved for elite, political captives (kings were at times beheaded). Non-elite captives were seldom sacrificed. Maya royalty would also sacrifice drops of their own blood as personal offerings to the gods. 3) QUESTION: Did beings from outer space build Copan, or any other Maya city? ANSWER: No. Evidence shows that the ancestors of contemporary Maya peoples built the ancient cities. There is no evidence that people from other parts of the world – or beings from outer space – helped the Maya build these impressive cities. 4) QUESTION: Were all the Maya rulers men? ANSWER: Although no female rulers are currently known at Copan, archaeologists recently excavated the largest and most complex tomb ever found at Copan, which contained the remains of a woman. She was a local woman who archaeologists believe was the wife of the founder of the Copan dynasty. At Palenque, Naranjo and a few other Maya sites, women did hold the position of ruler. 5) QUESTION: Did the losers get killed after the ball game? ANSWER: The ancient American ball game was played for over 1600 years in Mexico, Guatemala, Belize, Honduras, El Salvador, and it is still played in parts of Mexico. Like futbol (soccer), the ballgame’s rules have changed over time, and we do not know all of the changes. At some sites and during certain eras, there is evidence that some losers were sacrificed, but in most cases these games did not result in sacrifice. 6) QUESTION: Did the Maya live inside the pyramids? ANSWER: No, the Maya did not live inside the pyramids; these are solid structures. Pyramids are typically made for supporting temples that were the symbolic houses of supernatural beings, such as specific gods and ancestors. The Maya did live, work, study and worship their gods in the buildings that were built on top of the pyramids. 7) QUESTION: Are the pyramids tombs, like in Egypt? ANSWER: No, most pyramids are not technically tombs. The structures that look like pyramids were originally stepped terraces built to support a building on top. There are several different types of temples and the Maya used one type of pyramid temple for tombs. These special tomb-temples were funerary shrines dedicated to the memory of an ancestral king or other important official. 8) QUESTION: Where did the Maya come from? ANSWER: The Maya creation stories tell of the Maya being created from cornmeal by a creator god. Some say that the Maya people walked fully formed out of a cave from underneath a big mountain after gods wanted someone to worship them. There is modern scientific evidence that the Maya (and perhaps all American Indians) are the descendants of people who migrated to the Americas from Asia as early as 26,000 years ago. 9) QUESTION: Why is it called Copan? And what does that name mean? What did the Maya call it? 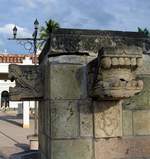 ANSWER: It is called Copan because Nahuatl speakers who moved into this area in the 1400s called it Copantl, which means “little bridge.” We do not know what the ancient Maya called their city. 10) QUESTION: Did the Maya really eat dogs? ANSWER: Yes. The Maya and other Native Americans raised dogs for hunting, guardians, and pets, much the way we do. There were special breeds that were used for food – usually for special rituals – not everyday meals. Maya dogs raised for food were hairless and did not bark. These were not their pets. 11) QUESTION: Did the Maya crawl around in the tunnels inside the pyramids? ANSWER: No, the tunnels inside the pyramids were dug by modern archaeologists so they can learn about the history of the buildings by studying the layers of buildings that are found below the outermost layer. You can now enter one of these tunnels and see the temple called Rosalila. 12) QUESTION: Did the trees grow out of the buildings while the Maya were here, too? ANSWER: No. The Maya did have fruit orchards and they planted trees around the city, but the trees you see today coming out from the walls and temples have grown since the ancient Maya abandoned the site in the 800s. 13) QUESTION: When did the ancient Maya live at the site of Copan? 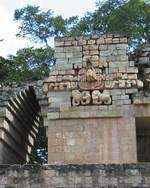 ANSWER: The Classic period of Maya architecture and art at Copan was from about 400 to about 820 AD. Maya people inhabited the Copan valley many centuries before the Classic period, and they still live in this lovely valley.